Being a member of a workout gym is expensive. Sure, you only need to pay about $50 a month for unlimited access to the gym’s facilities. The problem is that people today are so into healthy living that most gyms are crowded. This means that your “unlimited access” will be reduced to using very few equipment. This is why a lot of people are opting to have their own personal gym at home. They get to save money and improve the result. If this is something that you are looking into, rest assured that you need not have as much equipment as the gym you used to be a member of. The single most important piece of equipment that you need to have at home is a power rack. With it, you can do a whole lot of different workouts with optimum results. · Size. BD-7’s 2”x2” frame is made up of 12-gauge steel. It offers a good in cage working space with 23.5” from the front to back and 43.5” from side to side. Moreover, the total length of the rack frame is 55”. This enables the user to have enough mobility in the cage to maximize his workout. · Installation and Setup. The BD-7 Power Rack comes with a very straight forward installation process. This means that you can easily put it together without having to bother asking for professional assistance. The product also comes with detailed instructions and diagrams so there is no way you can get it wrong. · Safety. This power rack is built with safety in mind at all times. It was designed with 2 safety catch bars that can be easily adjusted to assist the user during workouts especially squats and bench press. Moreover, solid steel bars are also anchored through the frame with twist adjustment and travels through the depth of the frame. This means that if by any chance you are having difficulty returning the bar to the top position, you can simply drop the bar on the safety bar catch and step out of the cage. 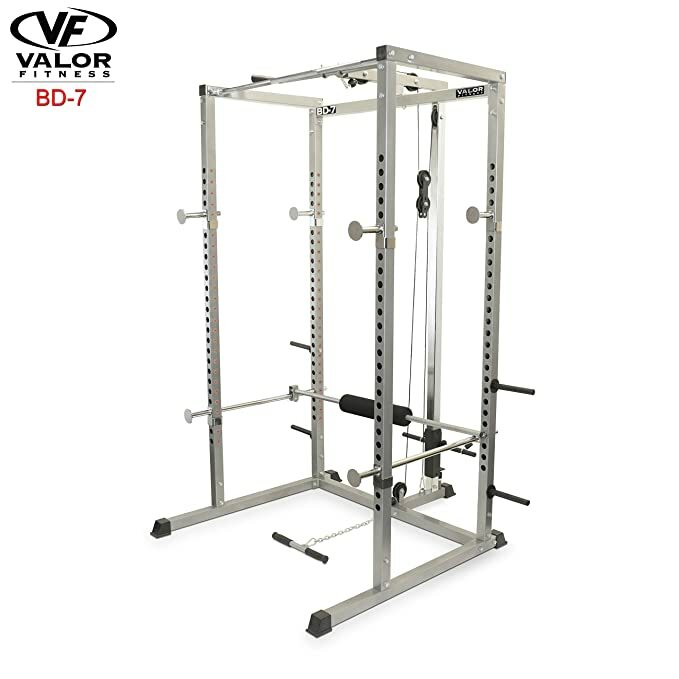 Valor Athletic have designed the safety bar catch to absorb the force of a dropped heavy bar. · Flexibility. This rack offers 4 plate storage pegs at the back and another two on each side. These pegs are standard sizes but can easily cater 2” Olympic plates with the pegs measuring 8”. This simply means that you have an option to use standard as well as Olympic plates depending on your preferences and level of workout intensity. Some of the best workouts out there can be done with a power rack. Couple it with barbells and a good bench and you are well on your way to experiencing a complete training that has been proven by countless athletes all over the world to work wonders. The BD-7 Power Rack will be one of the best investments you can have for your home gym and your fitness.Click here for our review of the best power racks available today.